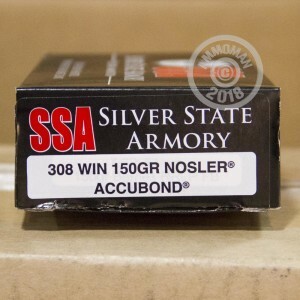 This .308 Winchester ammunition is a highly effective hunting load featuring Nosler's AccuBond polymer-tipped hollow point bullet. 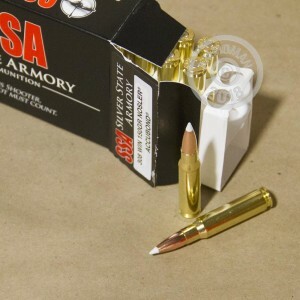 Manufactured by Silver State Armory of Packwood, WA, these cartridges come in boxes of 20 and fire a light 150 grain projectile at 2,720 feet per second. The AccuBond bullet is known for its devastating effect on various game animals including deer. A bonded core design, it features a heavy boat-tailed base designed to enhances its mushrooming effect and produce faster incapacitation of the target. 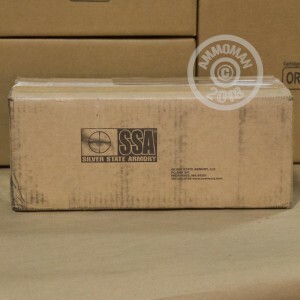 Like other SSA products, these cartridges use non-corrosive Boxer primers and brass cases. Place an order today at AmmoMan.com for $99 or more to get free shipping!